One of the main information workflow in a Rudder managed system is the node’s inventory one. Node inventories are generated on nodes, are sent to the node policy server (be it a Relay or the Root server) up to the Root server, and stored in the Rudder database (technically an LDAP server), waiting for later use. The goal of that section is to detail the different steps and explain how to spot and solve a problem on the inventory workflow. Following diagram sum up the whole process. Inventories are generated daily during an agent run in the 00:00-06:00 time frame window local to the node. The exact time is randomly spread on the time frame for a set of nodes, but each node will always keep the same time (modulo the exact time of the run). The individual commands can be displayed with the -i option to rudder agent inventory command. on each agent runs, files in /var/rudder/inventories/incoming are forwarded to the Relay own policy server. in parallel, inventory web parses and updates Rudder database. To have a better understanding of the Archive feature of Rudder, a description of the data workflow can be useful. At the first level, techniques are classified in categories: applications, fileConfiguration, fileDistribution, jobScheduling, system, systemSettings. The description of the category is included in category.xml. At the second and third level, Technique identifier and version. At the last level, each technique is described with a metadata.xml file and one or several agent template files (name ending with .st). At Rudder Server startup, or after the user has requested a reload of the Rudder Techniques, each metadata.xml is mapped in memory, and used to create the LDAP subtree of Active Techniques. The LDAP tree contains also a set of subtrees for Node Groups, Rules and Node Configurations. At each change of the Node Configurations, Rudder Server generates the agent policies for the Nodes. The community version of CFEngine, a powerful open source configuration management tool. An initial configuration set for the agent, to bootstrap the Rudder Root Server access. These components are recognized for their reliability and minimal impact on performances. Our tests showed their memory consumption is usually under 10 MB of RAM during their execution. So you can safely install them on your servers. We grouped all these tools in one package, to ease the Rudder Agent installation. In this chapter, we will have a more detailed view of the Rudder Agent workflow. What files and processes are created or modified at the installation of the Rudder Agent? What is happening when a new Node is created? What are the recurrent tasks performed by the Rudder Agent? How does the Rudder Server handle the requests coming from the Rudder Agent? The Rudder Agent workflow diagram summarizes the process that will be described in the next pages. Let’s consider the Rudder Agent is installed and configured on the new Node. The first action of Rudder Agent is to fetch the tools directory from Rudder Server. This directory is located at /opt/rudder/share/tools on the Rudder Server and at /var/rudder/tools on the Node. If this directory is already present, only changes will be updated. The agent then try to fetch new Applied Policies from Rudder Server. Only requests from valid Nodes will be accepted. At first run and until the Node has been validated in Rudder, this step fails. Ensure that the agent daemons cf-execd and cf-serverd are running. Try to start these daemons if they are not already started. Add a line in /etc/crontab to launch cf-execd if it’s not running. Ensure again that the agent daemons cf-execd and cf-serverd are running. Try to start these daemons if they are not already started. Ensure the curl package is installed. Install the package if it’s not present. If no inventory has been sent since 8 hours, or if a forced inventory has been requested (class force_inventory is defined), do and send an inventory to the server. No reports are generated until the Node has been validated in Rudder Server. After validation of the Node, the system log service of the Node is configured to send reports regularly to the server. Supported system log providers are: syslogd, rsyslogd and syslog-ng. Apply other policies and write reports locally. Rudder components are distributed as a set of packages. 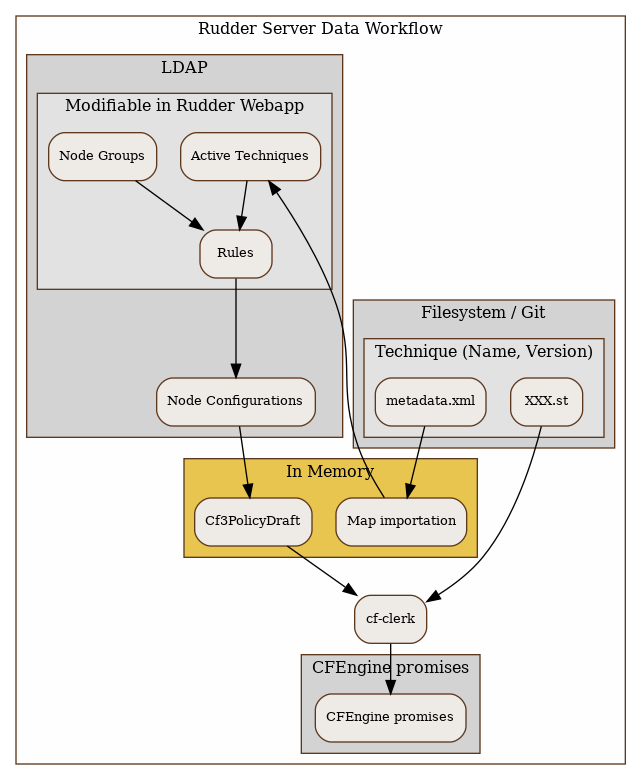 Package for the Rudder Web Application. It is the graphical interface for Rudder. Package for the inventory reception service. It has no graphical interface. This service is using HTTP as transport protocol. It receives an parses the files sent by FusionInventory and insert the valuable data into the LDAP database. 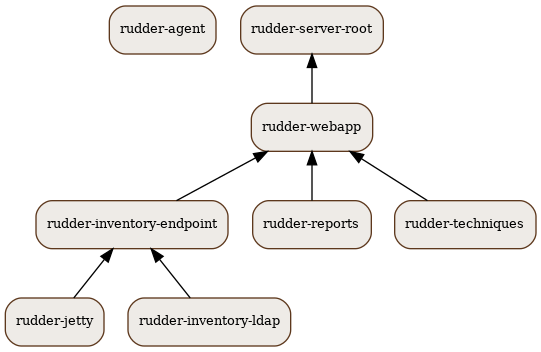 Application server for rudder-webapp and rudder-inventory-endpoint. Both packages are written in 'Scala'. At compilation time, they are converted into .war files. They need to be run in an application server. 'Jetty' is this application server. It depends on a compatible Java 8 Runtime Environment. Package for the Techniques. They are installed in /opt/rudder/share/techniques. At runtime, the Techniques are copied into a 'git' repository in /var/rudder/configuration-repository. Therefore, the package depends on the git package. Package for the database containing the inventory and configuration information for each pending and validated Node. This 'LDAP' database is build upon 'OpenLDAP' server. The 'OpenLDAP' engine is contained in the package. Package for the database containing the logs sent by each Node and the reports computed by Rudder. This is a 'PostgreSQL' database using the 'PostgreSQL' engine of the distribution. The package has a dependency on the postgresl package, creates the database named rudder and installs the inialisation scripts for that database in /opt/rudder/etc/postgresql/*.sql. The Rudder Web application requires the installation of 'Apache 2 httpd', 'JRE 7+', and 'cURL'; the LDAP Inventory service needs 'rsyslog' and the report service requires 'PostgreSQL'. The Apache Web server is used as a proxy to give HTTP access to the Web Application. It is also used to give writable WebDAV access for the inventory. 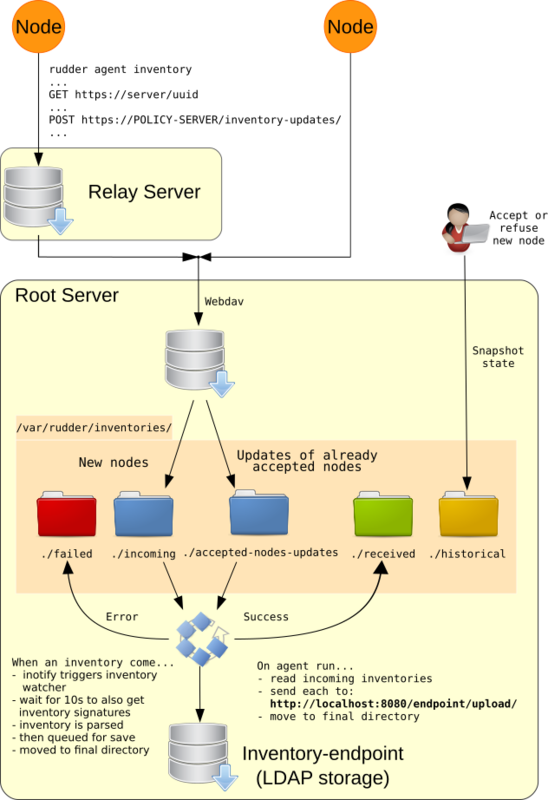 The Nodes send their inventory to the WebDAV service, the inventory is stored in /var/rudder/inventories/incoming. The PostgreSQL database is used to store logs sent by the Nodes and reports generated by Rudder. Rudder 4.0 is tested for PostgreSQL 9.2 and higher. It still works with version 8.4 to 9.1, but not warranties are made that it will hold in the future. It is really recommanded to migrate to PostgreSQL 9.2 at least. The rsyslog server is receiving the logs from the nodes and insert them into a PostgreSQL database. On SLES, the rsyslog-pgsql package is not part of the distribution, it can be downloaded alongside Rudder packages. The Java runtime is needed by the Jetty application server. Where possible, the package from the distribution is used, else a Java RE must be downloaded from Oracle’s website (http://www.java.com). This package is used to send inventory files from /var/rudder/inventories/incoming to the Rudder Endpoint. The running Techniques Library is maintained as a git repository in /var/rudder/configuration-repository/techniques.